Note: for those of you that know me, you might want to be sitting down to see some of the photos in this post! Seriously! Tonight, I hosted the first themed meeting. Our theme was thyme and everyone brought a dish using thyme. I enjoy having people to house, but I am guilty of never having a clear surface to place anything and that involves time and planning on my part to get the house in order. I have had since the end of November! I did it! This all fits right in to the January Cure that Xan has been posting about. I can’t seem to find time to post on a regular basis on my personal blag, I can’t seem to find the time to read up on all the blogs I enjoy reading, and I can’t seem to find the time to even read the January Cure posts. I’m and very frugal with our money and don’t buy luxury-type items, so I am with Xan and don’t agree with buying fresh cut flowers each weekend. I do not need fresh flowers to feel good. My mom did send me flowers over 2 weeks ago, and I am still enjoying them. Last week I also bought flowers for my neighbor/friends as a thank you for picking up groceries, but also, I know they are sad with the passing of their son and the flowers sure perked them up. That makes me feel good! As the day went on, 14 dropped to 4. How they heck do you go from expecting 14 people down to 4! Freezing rain! Yes, we get there here in San Antonio from time to time…. this was one of those times. We had a good time talking about thyme and visiting. Here is my creation for the thyme-themed meeting tonight. I went with an appetizer – because I was spending all my time and energy cleaning the house, I wanted to keep it simple and easy to make. It was a success! Bring your goat cheese up to room temperature so it is easier to work with. Slice or dice onion and caramelize it in a fry pan. If you want to sweeten your onions a bit more, add a bit of sugar are you caramelize them. While onions are caramelizing, mix goat cheese, sour cream/yogurt and thyme together. Use as much sour cream/yogurt as you need to create the consistency you like. Cut your bread in sizes/shapes that you want and toast it. Set aside to cool. 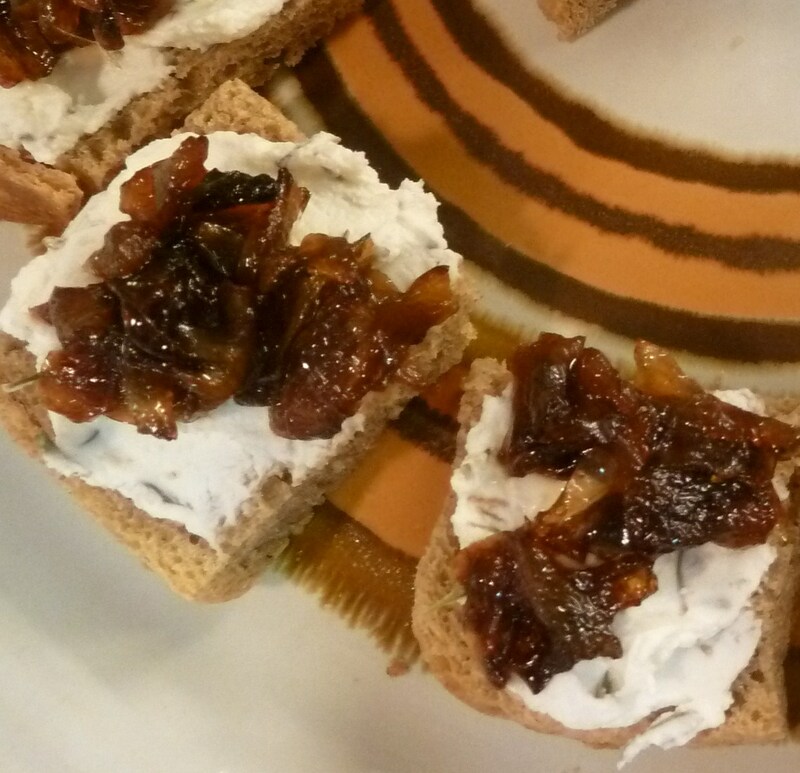 Spread crostini with goat cheese mixture. All elements of this appetizer can be made ahead of time. Just pull them out of the refrigerator and allow them to come up to room temperature, and assemble them right before you guest arrive. I guess this evening fit in with the January Cure – Plan a get-together. 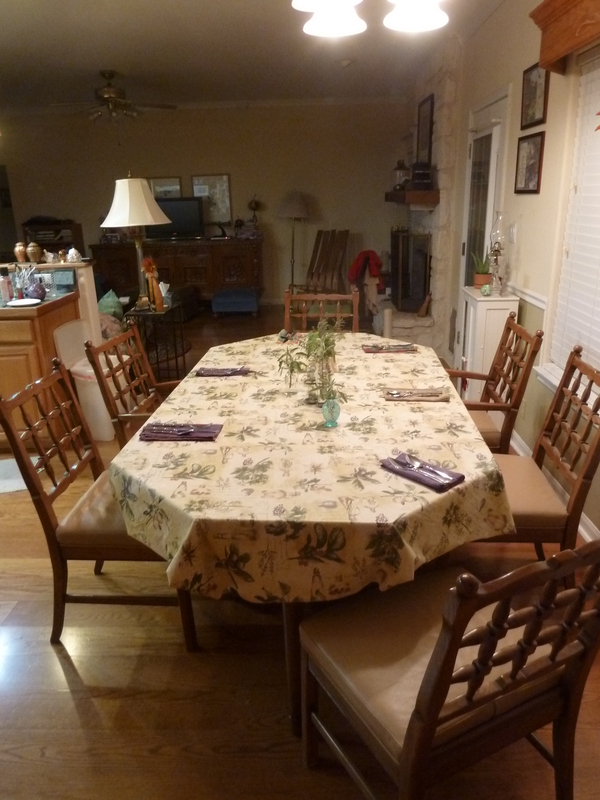 We also have some friend coming over for dinner in a few weeks…. I sure hope the house looks this good when that rolls around! Do you have any house cleaning/organizing projects that you are working on? Oh my! I am so impressed, both with the looks of the crostini and with the house! Wow, that looks delicious. Will try this next week for our anniversary treat!!! Your home looks great…….. Nice focus, proud of you. 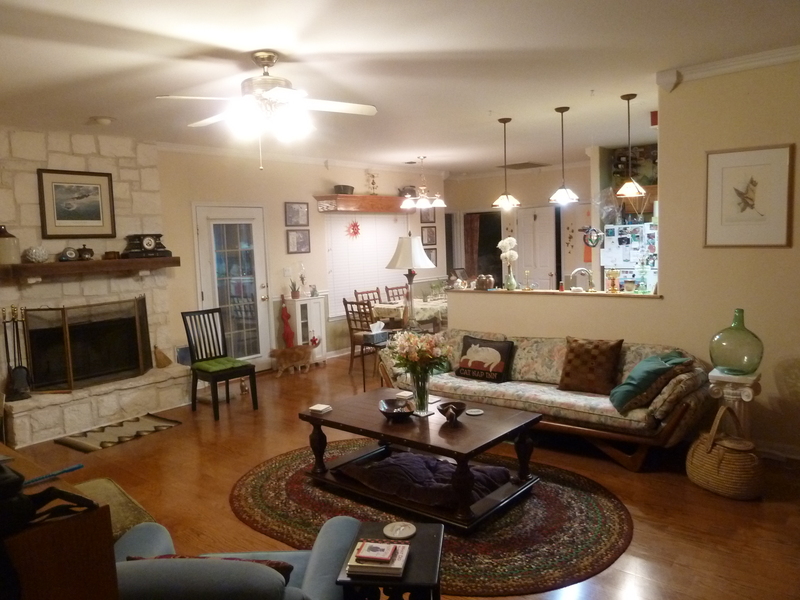 Everything looks wonderful and your home looks warm and inviting! I am with you here! I need more time in my day (that isn’t taken up by work).